Huawei P8 is the latest android smartphone from the Huawei and the phone come with some awesome specs and features. It has 5.2-inch, 1080p Full HD display; 13-megapixel OIS-enhanced camera; Android 5.0 Lollipop; 2600mAh battery. 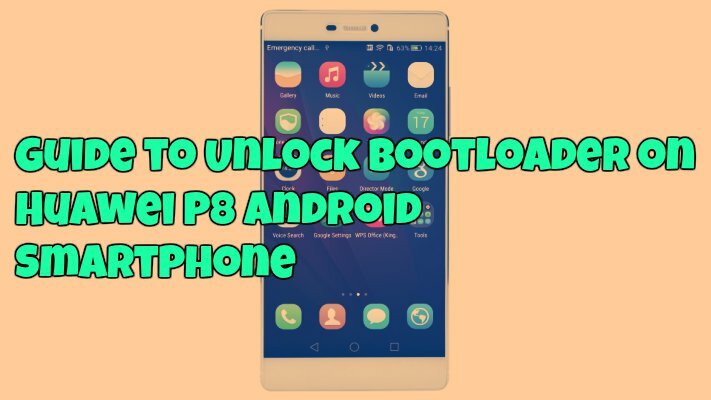 If you recently bought this device and looking for the guide how to unlock the bootloader of the phone. Here is the complete guide which allows you to do the same and once the bootloader of the phone is unlocked, you can easily install the custom recovery and root the phone with SyperSu. The whole unlocking process will take some time but not that difficult. To do this, you have to contact the Huawei to get the unlocking code and then proceed with the manual coding yourself. NOTE: – Unlocking bootloader will wipe all your data from the phone. So do take the full backup of your important data, files, images, videos, messages, contacts etc. After that real all the instruction very carefully and follow them step by step on your phone. Step 1. Download the ADB and fastboot file on your windows here and this will create an ADB and fastboot folder on your C: Drive. You need to use this folder to unlock the bootloader of your phone. Step 2. Once the ADB and fastboot drivers are setup on your windows. You need to send an email to Huawei with your phone Serial Number, IMEI and Product ID. To Find IMEI: – Go to Settings, then click on About Phone and then on Status. To Find Serial Number (SN): – Go to Settings, then click on About Phone and then on Status. To Find Product ID: – Enter *#*#1357946#*#* into the dialer to view your Product ID. Step 4. Very soon you will get a reply from them with the unlocking code. Step 5. Now enable the USB debuggin mode on your phone. Step 6. Turn off your phone and boot in Bootloader / Fastboot Mode. Press Volume Up + Volume Down + Power keys for a few seconds till you see some text on the screen. This is the Bootloader Mode which allows Fastboot to communicate with your phone. Step 7. Now go the C: Drive ADB folder that you created in Step 1, and open Command Prompt (Shift + Right-click > Open Command Prompt). Step 9. Now follow all the onscreen insteruction to unlock your phone. That’s it! Your Huawei P8 bootloader is now unlocked!